This page features early Sharp "COS" LCD calculators. 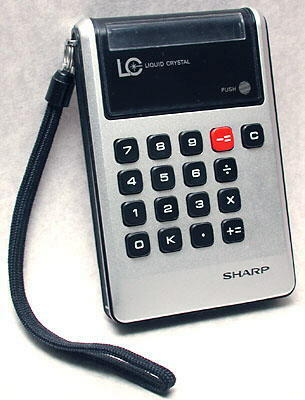 Sharp was one of the pioneers of LCD (Liquid Crystal Display) calculators. The company's "COS" (Crystal on Substrate) technology is a method of manufacture used in the early Sharp LCD calculators where the LCD is formed directly on a glass circuit board substrate (see Facit 1106, below) on which the other electronic components are mounted, as in the EL-805. The LCDs produced have the now unusual feature of silver reflective digits on a dark background. Some subsequent Sharp models, although not having the LCD directly formed on the circuit board, also feature the reflective digits and are commonly referred to as "COS" models. Distinctive features: The first pocket-sized calculator with liquid crystal display (LCD), with reflective digits. Uses Sharp's COS (Crystal on Substrate) technology. Display is 8 digits, reflective LCD. 80 mm x 120 mm x 21 mm (3.1" x 4.75" x 0.8"). 1973. Cost in U.S.A. in December 1973 was US$109.95. 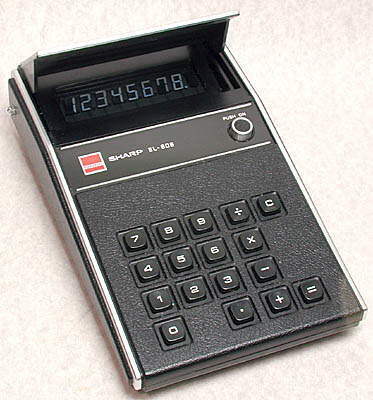 The Sharp EL-805 of 1973 was the first pocket-sized calculator with a Liquid Crystal display (LCD) and used Sharp's "COS" (Crystal on Substrate) technology, see the photograph of the Facit 1106 / Sharp EL-805S below. 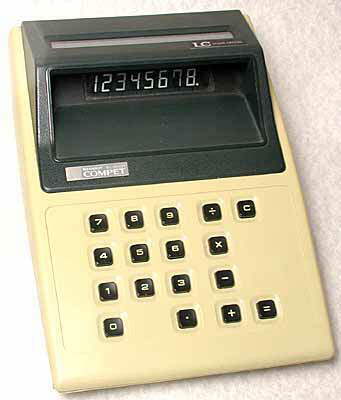 There had been previous LCD calculators, such as the Lloyds models, but these were much larger. 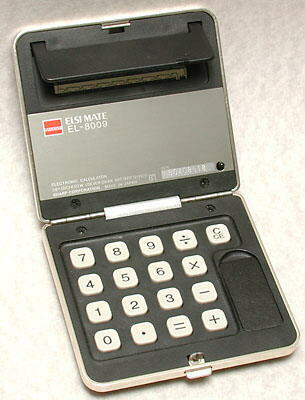 The Sharp EL-805 with the display cover closed. One characteristic of these early LCDs is that the numbers are reflective, rather than black, as is now normal. A flip-up display cover protects the LCD, and with its window for illumination also makes sure that the display is illuminated for maximum visibility. 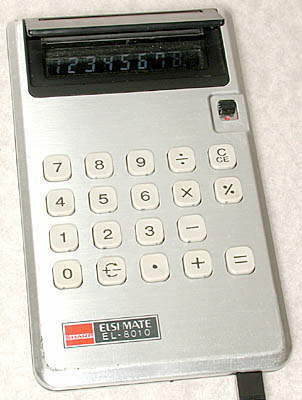 Using this technology, the Sharp Compet EL-805 calculator was launched as the world first battery-powered LCD pocket calculator. 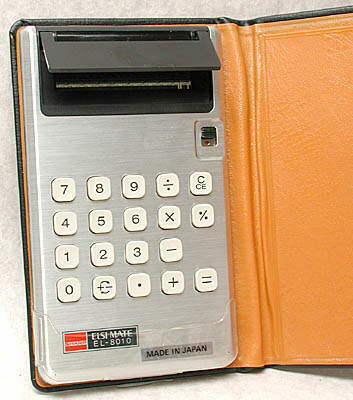 This was a breakthrough in the sense that the MOS-LSI and LCD technologies established by this calculator was the starting point for the development of the low-power mobile appliances and personal computers of today. 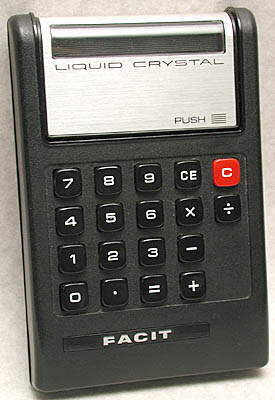 The true COS (Crystal on Substrate or Calculator on Substrate) calculator, as here (see photograph of inside the Facit 1106 below), has a circuit board which appears to be made of glass. The LCD display is formed directly on this circuit board, which also carries at least two layers of conductive tracks separated by a white, insulating lacquer, and the electronic components. The user actually looks through the circuit board when viewing the display, and the glasss board has no holes in it, all of the components being surface-mount types. The use of the glass circuit board appears to have been a dead-end in the development of calculators, perhaps because of cost. Subsequent models from Sharp with this type of display have conventional circuit boards, though their LCD display modules have a similar construction to the display section on the glass circuit boards. All the Sharp models with displays with reflective LCD characters are often referred to as COS models, though this may really only refer to these early examples with the glass circuit boards. Other examples are illustrated on this page. Integrated circuits - Toshiba T3255, T3256, T3288 (here date coded 1974). This Facit 1106 is similar to the Sharp EL-805S, except the casing is black plastic whereas the front of the Sharp EL-805S is brushed metal. 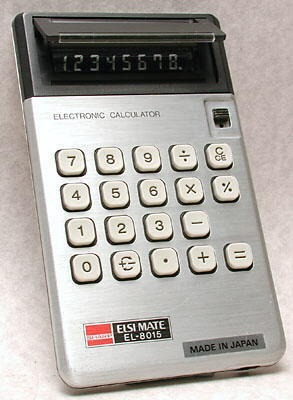 The Sharp EL-805 of 1973 was the first calculator with a COS (Crystal on Substrate) LCD (Liquid Crystal Display). 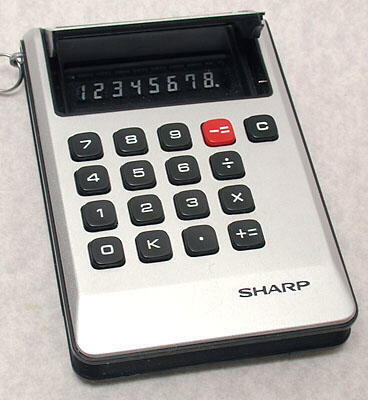 A few months later in 1973 the Sharp EL-805S was introduced, with improvements such as a brighter display. 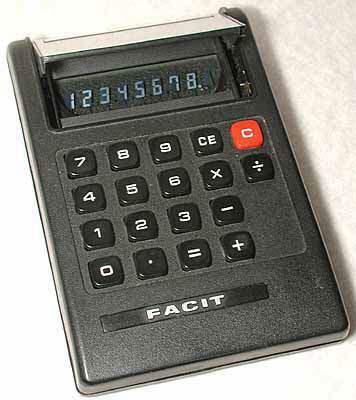 In the late 1960s and early 1970s Sharp produced calculators for the Swedish Facit company. 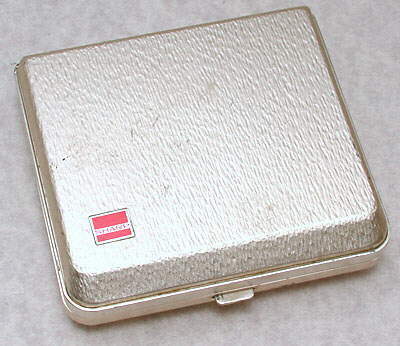 Most are similar to Sharp models but with differently styled casings. This model is based on the Sharp EL-805S. With the display cover closed. 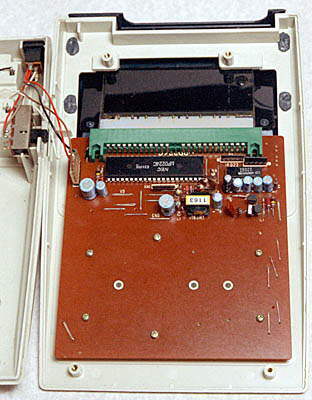 With the rear cover removed showing the surface-mount components and the LCD on the glass circuit board. The user looks through the circuit board (from the other side of course) when operating the calculator. 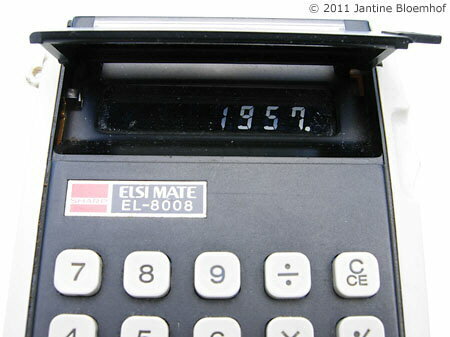 The early LCDs (Liquid Crystal Displays) in calculators were unusual in that the numbers appear silvery against a dark background - the reverse of modern LCDs. To aid visibility many of these calculators have a hood over the display with a carefully placed window to allow light to be reflected off the digits, as here. Although Sharp were one of the pioneers of LCD displays, Rockwell are usually credited with producing the first commercial ones in the previous year, 1972, see the Lloyds Accumatic 100. However, Rockwell quit LCD calculators after a few models whereas Sharp persisted with the development of LCD displays and later produced many models with the now familiar LCD with black digits. Display is 8 digits, reflective LCD, with flip-up cover. Main integrated circuits - NEC uPD224C & Sharp IR022 (here date coded 1973). 107 mm x 176 mm x 40 mm (4.25" x 6.9" x 1.6"). Main integrated circuit - NEC uPD224C (here date coded 1973). 144 mm x 212 mm x 70 mm (5.7" x 8.5" x 2.75"). This is a large calculator designed as a portable desktop model and is too big to fit in a pocket. Surprisingly for a model with LCD display, which have low power consumption, it is powered by 4 large size C cells. Perhaps it was intended to be left powered up all day. 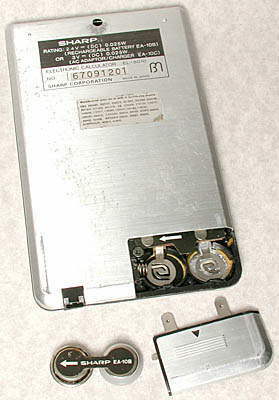 The Sharp EL-8001 with the back cover removed. 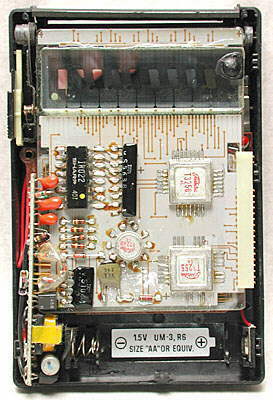 This shows the conventional phenolic composite circuit board with the integrated circuit mounted towards the top, and the display, seen from the back, as a module which plugs into the green socket. With the display cover flipped up. Photographs kindly supplied by Jantine Bloemhof. 2x silver oxide button cells. Closed 79 x 144 x 11 mm / 3.1 x 5.7 x 0.4". Open 79 x 73 x 19 mm / 3.1 x 2.9 x 0.75"
Available in 4 different finishes, 2 metallic and 2 leather-type. The clam-shell design allows full protection for the keyboard and display while giving a very small size. The calculator is automatically switched on when opened and off when closed. 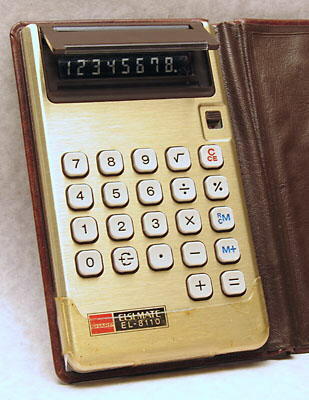 A brochure for Sharp calculators states for this model "4 different elegant finishes available: metallic gold or silver, or fine leather in brown or red". 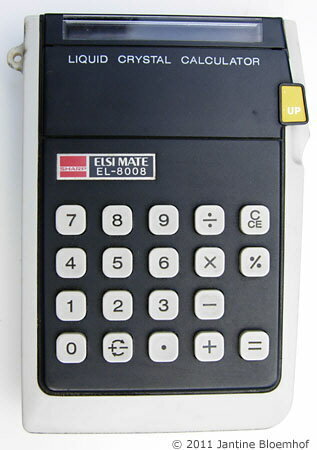 The Sharp EL-8009S closed. It has a light-gold coloured metallic finish. 2x rechargeable Ni-cad button cells in an assembly, EA-10B. Or, with battery adapter, 2x Silver oxide, or 2x Mercury cells. 76 x 129 x 10 mm (3.0" x 5.1" x 0.4"). 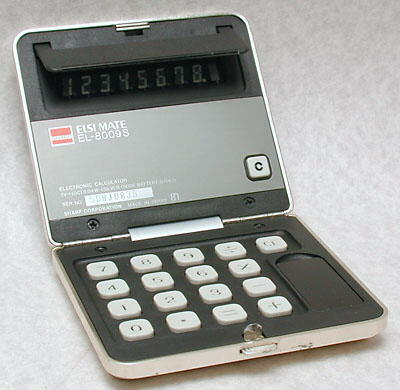 The small size of this calculator, especially the small thickness, allowed it to be one of the first that was provided with a folding case, into which it clips, for protection in the pocket coupled with ease of use. 4 function, %, memory, square root. "100-hour calculator", Popular Science, December 1973, p87.